When promoting territorial economic development from an innovation systems perspective it is important to find ways of increasing the use of knowledge and innovation in the region. However, in mainstream economic development there is a tendency to target the private sector based on scale. This means that practitioners look at quantitative measures such as jobs, numbers of enterprises, numbers of beneficiaries, etc. when deciding where to do analysis and focus support. This is common practice in value chain promotion, sub sector selection, etc. Many development programmes do this as well prioritizing scale measures such as jobs, women, rural individuals, etc. From my experience of assisting development organisations to strengthen the economic resilience of regional economies (which means more innovation, more experiments, more diversity, increased use of knowledge, more collaboration between different technological domains), I have found that the scale argument is distracting and too focused on the beneficiaries (whatever is counted) and not focused enough on those indirect public or private agents that are significant and that enable a whole variety of economic activities to take place. With significant I mean that there could even be only one stakeholder or entry point (so the direct scale measure is low) but by addressing an issue it enables a whole variety of economic activities to take place. Of course, scale is very important when a local politicians need votes. It is also important when you have limited budget and must try to achieve wide spread benefit. For this reason scale is very important for social programmes. However, when local institutions are trying to strengthen the local innovation system, in other words improve the diversity technological capability of a region, then scale becomes a second priority. The first priority then becomes identifying economic activity that enables diversity or that reduces the costs for enterprises to innovate, use knowledge more productively should be targeted. The reason why this does not happen naturally is that these activities are often much harder to detect. To make it worse, “significance” could also be a matter of opinion (which means you have to actually speak to enterprises and their supporting institutions) while crunching data and making graphs often feel safer and appear to be more rigorous. My argument is that in regions, the long term evolution and growth of the economy is based on supporting diversification and the creation of options. These options are combined and recombined by entrepreneurs to create new economic value in the region, and in so doing they create more options for others. By focusing exclusively on scale, economic actors and their networks increasingly behave in a homogeneous way. Innovation becomes harder, economic diversity is not really increased. I would go as far as saying that success becomes a trap, because once a recipe is proven it is also harder to change. As the different actors becomes more interdependent and synchronized the system becomes path dependent. Some systems thinkers refer to this phenomena as tightly coupled, meaning a failure in one area quickly spills over into other areas. This explains why whole regions goes into decline when key industries are in decline, the economic system in the region became too tightly coupled. But I must contradict myself just briefly. When interventions are more generic in nature, meaning they address market failures that affect many different industries and economic activities, then scale is of course important. The experienced development practitioners manage to develop portfolios where there are some activities that are about scale (for instance, targeting a large number of informal traders) and then some activities that are about significance (for instance ensuring that local conformity testing labs are accessible to local manufacturers). The real challenge is to figure out what the emergent significant economic activities are that improves the technological capability in the region. New emergent ideas are undermined by market failures and often struggle to gain traction. Many new activities requires a certain minimum economic scale before it can be sustained, but this is a different kind of scale than when practitioners use scale of impact as a selection criteria. Many small but significant economic activities cannot grow if they do not receive public support in the form of promotion, awareness raising or perhaps some carefully designed funding support. There are a wide range of market failures such as high coordination costs with other actors, high search cost, adverse selection, information asymmetry and public good failures that undermines emergence in local economies. It is exactly for this reason that public sector support at a territorial level (meaning sub national) must be sensitive to these market failures and how they undermine the emergence of new ideas that could be significant to others. The challenge is that often local stakeholders such as local governments have limited influence over public institutions in the region that are funded from other spheres of public administration. Let me wrap up. My argument is that scale is often the wrong place to start when trying to improve the innovation system in a region. Yes, there are instances where scale is important. But my argument is that some things that could be significant, like the emergence of variety and new ideas often get lost when interventions are selected based on outreach. Furthermore, the focus on large scale impact draws the attention to symptoms of problems and not the the institutional or technological institutions that are supposed to address market failures and support the emergence of novelty. I will stop writing now, Marcus always complains that my posts are too long! Let me know if I should expand on the kinds of market failures that prevent local economies from becoming technologically more capable. Our industry in South Africa is constantly complaining that their workers have the wrong (or low) skills. Yet based on my own experience, many manufacturers prefer to appoint people from the street and then train them in-house on the job. This saves the business money and bargains the wage down, but at the same time makes it very difficult for the enterprise to respond to technological change. And when all your workers are at a low skills level, the technological advancement of the firm is almost completely dependent on the genius (!!) of the entrepreneur and the middle management. This is a risk for our industry as we do not embrace learn-by-doing enough as our competitors are doing because we do not trust the ability of our workforce. The South African government itself acknowledge the importance of jobs intensive growth, especially aimed at lower skilled workers. I sometimes wonder if our government has given up on its education system, but then the large and continued investments in the overall education system seems to suggest otherwise. The education policy has a strong focus on vocational training, but learners still prefer to queue at our Universities despite the best attempts of the minister to highlight the value of Further Education Colleges and the recent investments into the vocational system in the country. While the importance of making sure that our large numbers of low skilled workers do get some form of employment and further education, I wonder if we do not need a stronger dual focus on other forms of education and more skills intensive job creation. Also, I wonder if we do not need to strengthen our ongoing education aimed at people currently employed. I know the Skills Education and Training Authorities (SETAs) are supposed to do this, but from the businesses that I work with it seems that this is a frustrating option – the skills levy is basically treated as a tax. The SETAs are also focused very much on basic skills and not on deep technological skills. As long ago as 1987, Lawrence and Schultze criticized the European education system with its focus on apprenticeships that provides rather specific skills to rather standard and mature technologies. These technologies become obsolete very fast in times of rapid technological change. Furthermore, these skills do not help our enterprises to get ahead, they simply help the lower productivity part of the economy to catch up. Many other scholars have come to the some conclusions about Europe’s education system, advising them to follow the US model of equipping graduates with a more generic education that helps people to adapt to a more dynamic work and technological environment. For in case you wondered, South Africa is undergoing huge technological change. With the energy problems this technology intensification is accelerating as enterprises try to upgrade to lower energy manufacturing technology. To get ahead we need to invest more in creating middle and higher skills capacity, more or less what the learners are sensing. From an economic policy perspective, we need to support the enterprises that are in the more knowledge intensive industries. They still absorb lower skills workers, but at least in these enterprises their development paths are more varied and more secure. While at the job-intensive low skill industries these lower-skilled workers are vulnerable due to South Africa’s poor cost competitiveness on many basic manufactured goods. At the same time, we have to continue and even expand upgrading our workforce with vocational training, if not for any other reason than to give people a deeper sense of pride and dignity. Lawrence, R., Schultze, C., 1987. Overview. In: Lawrence, R., Schultze, C.(Eds. ), Barriers to European Growth: A Transatlantic View. The Brookings Institution, Washington, DC. In order to improve the economic performance of an industry or a territory, it is important to recognize the current Status Quo of the economy. This is basically to understand “what is?”, but to also understand “what is possible next?”. You may think that local stakeholders, firms and public officials will know the answer to “what is going on now?”, but every time I have done such an assessment I have discovered new suppliers, new innovations, new demands and many new connections between different actors. The benefit of being a facilitator, process consultant or development expert, is that we can move between different actors, observe certain trends, recognize gaps and form an overall picture of what we think is going on. It is very difficult for enterprises to form such a picture as they can only observe other firms from a distance. The main challenge is about figuring out what can be done to improve certain gaps or to change the patterns that we observe. These are answers to “What is possible next?” questions . As Mesopartner, we always insist that any process to diagnose an industry or a region starts with the formulation of various hypothesis. This hypothesis formulation before we commence is not only about revealing our bias, nor only about figuring out what exactly we want to find out. It also helps us to figure out what kind of process is needed, the scope of the analysis and what different actors expect from the process. Unlike in academic or scientific research, hypothesis formulation does not only happen in the early stages of a diagnostic or improvement process, it should be constantly reflected upon and expanded as we go on during the process of meeting stakeholders and analyzing data. This is where the importance of recognizing competing hypothesis within our team and between different stakeholders are important.This process is not about convergence, but about revealing what different actors and the investigator believes is going on. Economic development practice is full of competing hypothesis that all seem to be very plausible. In a recent training event with Dave Snowden the consequences of not recognizing or revealing these competing hypothesis struck me. According to Dave, competing hypothesis that plausibly explains the same phenomena indicates that we are most likely dealing with a complex issue. For instance, in South Africa we have competing hypothesis about the role of small firms in the economy. One hypothesis is that small firms are engines of growth and innovation, therefore they deserve support. A competing hypothesis is that large firms invest more in innovation and growth, and that they are better drivers of economic growth. Both hypotheses are plausible – the issue is complex. Recognizing this complexity is very important, as the cause and effect relations are not easy to identify and they might even be changing – the situation is non-linear. (Marcus Jenal and I wrote a working paper on complexity in development). This simply means that to get a specific outcome, the path will most likely be indirect or oblique – cause and effect is not linear. Why is it important to recognize competing hypothesis, or to know when some patterns in the economy or complex? The answer is that it is almost impossible to analyze a complex issue with normal diagnostic instruments. Complex patterns can only be understood by engagement, that is, through experimentation. Again, according to Dave Snowden, you have to probe a complex issue by trying several different possible fixes simultaneously, then observe (sense) what seems to work best under the current circumstances. The bottom line is that you analyze a complex issue by experimenting with it, not by observing or analyzing it. The implication of this insight in my own work has been huge. By recognizing that many issues that I am dealing with are complex (due to competing hypothesis that are very plausible) and can only be addressed through direct engagement has saved me and my customers a lot of resources that was previously spent on seemingly circular analysis. I now use the hypothesis formation with my clients to try and see if we have competing hypothesis of “what is” and “what must be done”. Where the hypothesis seems to be straight forward, we can define a research process to reveal what is going on and what can be done to improve the situation. But when we have different competing hypothesis of what is going on, we have to immediately devise several simultaneous experiments to try and find an upgrading path. I thought my customers would not like the idea of experiments, but I was wrong. The conditions are that you must take steps to ensure that there are many different experiments that are all very small, and that by design take different approaches to try and solve the same problem. This takes learning by doing to a new level – because now failure is as important as success as it helps us to find the paths to better performance by reducing alternatives and finding the factors in the context that makes progress possible. The biggest surprise for me is that this process of purposeful small experiments to see what is possible under current conditions (context) has unlocked my own and my customers creativity. Perhaps a topic for a separate blog is that to really uncover these competing hypothesis we have to make sure that we do not converge too soon about what we think is going on. Maintaining divergence and variety is key – this is another challenge for me as a facilitator that is used to helping minds meet! When working with development organizations in the mesolevel we often find that their programmes are very generic. The same can be said of the findings of many diagnosis. The result is that firms do not really use the services of these organizations, because the value add and the impact of the services are not really clear. For me there should always be a movement from the generic (e.g. the foundry sector is not competitive) towards the specific (e.g. the foundry industry is not competitive because it lacks capacity to do good front end engineering and design). After we have developed a sense of some specific issues that are affecting the performance of firms, there are two things we have to do. Firstly, we want to try and figure out if there is something that we can do at a more systemic level to try and influence the specific issues. With systemic I mean that instead of addressing a particular issue repeatedly at various firms, see if there are other ways to achieve the same outcome. An example would be instead of only offering a design service to firms, make sure that the university curricula includes sufficient content dealing with design. Of course, we should always strive to have multiple interventions to address a particular issue. Secondly, we should verify whether our specific findings are unique to the firms we have diagnosed or engaged with. For instance, and food initiative run by a university might find that the private sector is affected by a lack of a particular kind of testing lab. Then instead of designing a solution just for a limited number of producers, the university should check whether similar firms in other industries (related and not even related) are facing the same constraints. It may just be possible to design a solution that is useful to a much broader target group, making the solution more sustainable and more relevant to the private sector. From my experience of working within many different value chains is that there are many issues that are treated as being unique (or specific) to a particular value chain that are in fact affecting many different kinds of enterprises. 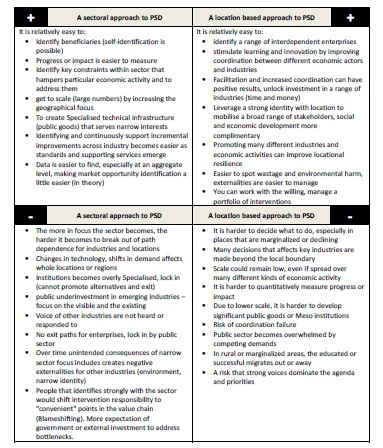 The South African Industrial Policy framework for instance is designed around many different sub-sectors, with many different interventions implemented by different organizations and programmes that are actually not unique to a particular sub-sector. This is expensive and also not really systemic, these interventions are not permanently changing the meso level in South Africa or the service offerings of meso organizations such as universities and other development programmes. The South African manufacturing sector is struggling with low volume, outdated designs and rapidly increasing costs across the board. I imagine that it should be possible to based on the insights from the different sub sectors to design much better programmes that are cross cutting over many different sub sectors, and that from the start are designed to improve the service offerings from meso organizations to firms. I wondered if I should name this post “from the airport lounge” but then I realized that I still travel much less than my business partners and some friends. Seeing that so many of you ask me where I am I thought I will give a quick update. 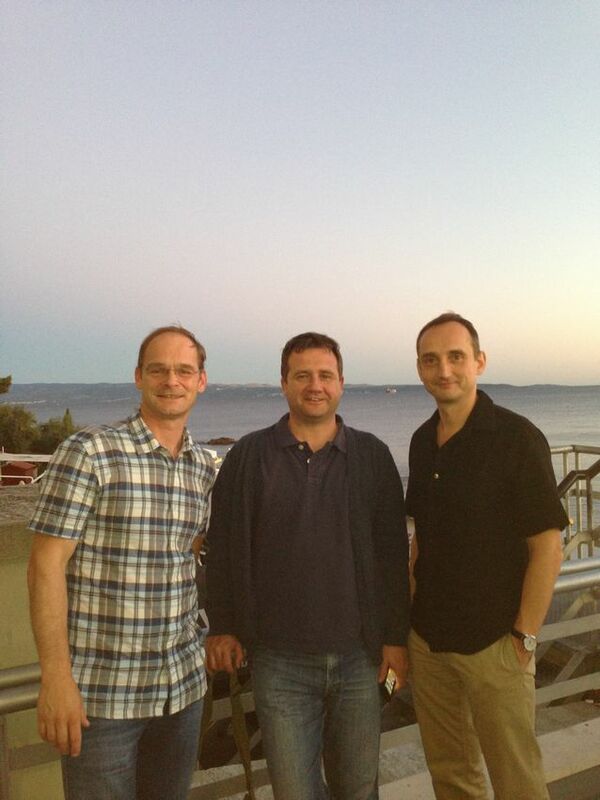 Since my previo us post I have traveled to Split in Croatia to conduct an LED training for a group of local government officials from Bosnia. This was a great event because I had the opportunity to conduct the training with my business partners Frank Waeltring and Christian Schoen. This event was arranged for and funded by GIZ Bosnia and took place during the first week of September. During this event it again struck me how no matter where we work with Local Economic Development, the main principles and challenges remain the same. The people, the language and also the priorities might be different, but the issues that we are always confronted by is a breakdown in trust between business and local government, fragmentation and confusion between local and national stakeholders, and the tension between bottom up and top down priorities and intervention means. Immediately after Croatia I traveled to India to assist GIZ India to assist with designing a Private Sector Development Programme. The mission included capacity building of local experts, consultants and policy makers on innovation systems and how this perspective can be used to strengthen cluster, value chain and regional development programmes. I traveled with the GIZ team to Bangalore and Aurangabad to assess the readiness of different clusters to benefit from an innovation systems perspective. In Delhi, my hotel room overlooked the famous Jantra Mantar astronomy instrument. 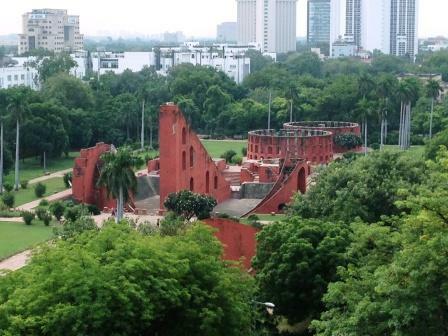 It is an heritage site that dates from 1724 that was one of the great astronomy observation posts of the time. I spent a whole Saturday morning looking at the details of this site. I also spent half a day on the Hop on Hop Off Bus in India. I am looking forward to traveling back to India shortly for an extension on this assignment.